Sofie is an Autism teacher teaching in a self-contained class in San Antonio, Texas. Sofie became passionate about creating and sharing ideas in the teacher community while teaching in South Africa where resources were slim. When she’s not laminating, cutting, or Velcro-ing, you can find her reading, hiking, or playing guitar! I have to be honest, when I first opened the Made For Me Literacy file, I printed the entire thing not knowing what I was doing. Then, there I was, with hundreds of pages of greatness. There are so many incredible and valuable things in this file, but how can we stay organized?! How can we store it all in an organized way once the month is complete so that next year we’re all set? Here are my best teacher hacks to avoid the paper trap and establish an organized system that sets you up for stress free teaching! Familiarize yourself with the content and print the files that your kids will use. Don’t print unnecessary papers if you already know you won’t use them! Do print any sort of example page or label page. You will these to organize! Keep all the papers you print in order. This sets you up to for easy storage. Before making copies, account for the master file in addition to what you need. This is probably the easiest and most convenient way to store all of the papers after printing them. Chances are, you have a spare binder laying around and if not, they are reasonably cheap to purchase. I love this idea because everything stays in a central location without moving around or losing any papers. By keeping a master copy of everything, next year you can simply take the entire binder to the copy room and make copies accordingly. These are your new bestfriend and so are the page sized sections labels in this file! Don’t skip over the lables. It keeps everything seperated, labeled, and easy to access. Anything that does NOT need to get copied goes into a sheet protector. This includes: Anchor chart examples, anchor chart pieces, or visual step procedures. If it IS something that I need copies of, I put it behind the sheet protector for easy access. This includes: cut and paste activities, writing activities, or the easy art pages. These are only about $5 each at Michael’s after using my teacher discount. They are approximately 14×14 inches and they fit all the things that a binder does not. 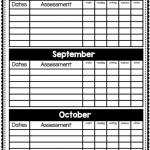 Task boxes, file folders, and completed examples of easy art activities. They are perfect for keeping papers contained without the risk of losing any. Did you know that the gallon sized bags can fit laminated papers?! This is such an easy way to separate the sections of the file. For example, you could put 1 week worth of lesson plan activities into each bag.. Zip lock bags make it so easy! A special education teacher’s day is often full of tension. Having engaging materials like the Made For Me Literacy curriculum most definitely helps take the stress out of teaching, but staying organized is also critical to creating more peaceful days.